As the Formula One circus heads into a new year and a fresh season, the hierarchy at the head of the sport has never seemed more settled. David Coulthard was right on schedule with his annual December 'Next year will be mine' proclamation, and Rubens Barrichello has made polite utterances about being 'the future of Ferrari'. Doubtless, both will have their moments over the coming season. But, when the championship chips are down, it's inevitable that the 2001 WDC will come down to a direct battle between Ferrari's Michael Schumacher and McLaren's Mika Hakkinen. Even though neither of the sport's two Titans has turned a wheel in anger since Malaysia (Schumacher in for surgery to his damaged leg, and the Finn on paternity leave), the pair are so dominant under pressure that it's inconceivable to imagine any other driver beating them over the course of a full season. Instead, there will be much attention focused further down the grid, where matters are anything but settled. Three teams (Prost, Arrows, Minardi) have yet to announce their full driver line-ups, and there will be several new faces in Jaguar's Luciano Burti and Sauber's Kimi Raikkonen. With such limited junior formulae experience, Finn Raikkonen's entry into F1 should have been the talking point of the pre-season. Instead, the imagination and attention of F1 fans has been grabbed by the two drivers who seem pre-destined to form the sport's 'next great rivalry' - Briton Jenson Button and Colombian Juan Pablo Montoya. Neither driver is likely to set a pole position or lead a Grand Prix in 2001, let alone win one. That, however, is a circumstance of inferior machinery and lack of experience. In terms of raw talent and growing popularity, both are rapidly reaching the zenith of already star-studded careers. The prospect of them sharing equal (and possibly dominant) machinery at Williams in 2003 has fuelled media and fan interest before they've even locked wheels in earnest. Barely a year and a half later, Button was strapped into a Williams for his debut Grand Prix start at Australia, albeit at the other end of the grid from Dennis's McLaren duo. The Englishman's jump from Formula Ford to F3 to Formula One in just three seasons was viewed as foolhardy and downright dangerous by some of the sport's luminaries, including 3-time WDC Jackie Stewart. Some wondered aloud if Frank Williams hadn't lost his senses in the furore following Alexandro Zanardi's untimely dismissal. 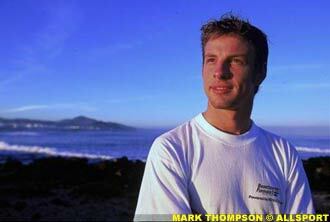 Yet there was nothing contrived nor flukey about Button's appointment as replacement for Zanardi. Before the final Jerez test in Williams's 1999/2000 off-season, it seemed a certainty that Bruno Junqueira would be starting the 2000 season as Ralf Schumacher's teammate. Button arrived at the Jerez test with little more than steely determination, faint hopes, and a glowing recommendation from Alain Prost, for whom he'd tested earlier. That Button aced the test was mere confirmation of what his Formula Ford team boss Jim Warren had asserted back in '98 - the Somerset youngster is an incredibly fast learner who can unravel a track's mysteries within a dozen laps. Nevertheless, Button had an horrendous learning curve to master in his first full season - a new formula, unfamiliar tracks, left-foot braking, the intricacies of F1 startline and pitstop procedures, and the cut and thrust of earning a living at the peak of motorsport. Before his first start in Australia, Button was approached by the Schumacher brothers, who offered friendly advice on the potentially dire consequences of even the tiniest misjudgement in F1. Button's reply was characteristically and disarmingly forthright - 'But I don't have accidents'. The remark allegedly amused Michael but infuriated Ralf, and matters didn't improve when Button went on to predict, early in the season, that he would 'soon be as fast as Ralf'. Patrick Head treated the prediction with disdain. Yet, by season's end, the stats told the story: Button had outqualified his highly-rated teammate half-a-dozen times, on some of the most technical circuits on the F1 calendar. Button's freshman season was nothing short of astonishing. He was unruffled and smooth in the heat of racing, his early-on-the-brakes, early-on-the-throttle technique giving him seemingly effortless Prost-like speed. As impressive as some of his qualifying efforts were, he usually finished races higher up the order than he started, a rare hallmark of commitment, concentration and fitness in such an inexperienced driver. The only blot on his copybook was the rookie mistake at Monza, which saw him leaving the track to avoid the train of slow-moving cars bunched up behind leader Michael Schumacher. For any driver, a Williams contract is something of a mixed blessing. The machinery is likely to be good, the team relations less so. Three of Williams's previous drivers (Zanardi, Frentzen, and Hill) had left the team under questionable circumstances. At the end of the 2000 season, Button too was forced to go - not because he'd failed to deliver, but simply because Williams were committed to another rising star. Enter Juan Pablo Montoya. Like Button, Montoya had enjoyed a stellar early career, winning his first karting title at the ripe old age of six. Unlike Button, he earned his racing stripes in Colombia, far from the F1 heartland of Europe. So his quest for ultimate F1 glory took the Colombian on a more convoluted course, from karts to saloons before zig-zagging across the Atlantic on his way to single-seater success in both F3000 and CART. 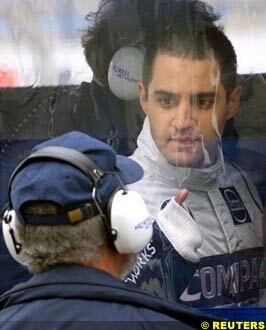 Montoya is quick to claim that he feels no pressure to succeed at Williams. When an F1 driver says that, it is usually through clenched teeth and with white knuckles. Montoya is the third straight CART champion to sign with Williams. Of the other two, Jacques Villeneuve almost aced the WDC in his debut season, while Alex Zanardi was equally eye-catching - unfortunately at the other end of the performance spectrum. That alone puts Montoya squarely in the spotlight, as pundits muse aloud whether he will follow Zanardi's or Villeneuve's precedent. The Button factor is a second pressure point. Frank Williams admitted that he may have erred in lending the Englishman to Benetton until 2003. If Button outperforms the Colombian this year, it will not be without recriminatory 'I told you so' glances across the pitlane. The third factor which will affect Montoya's mindset is one which will be overlooked by many - the teammate factor. Ralf Schumacher benefitted from Zanardi's dismal 1999 form to build himself up as Williams's franchise driver. Button's appointment as teammate in 2000 should have seen the German cement that position. Instead, the Englishman rattled his cage on several occasions, denting Schumacher Junior's reputation in the process. Ralf cannot afford to let that happen again, or he will increasingly be viewed as a contractual place-holder until Button's return in 2003. Over at Benetton, Button is unlikely to have an easy year either. Flavio Briatore is no easier than Frank Williams or Patrick Head in terms of driver relations, and Button also faces a once-promising teammate whose star is waning. It's ironic that just two seasons ago, Ralf Schumacher and Giancarlo Fisichella were both hailed as legitimate pretenders to the throne. Now, they must both play the role of grizzled veterans, guarding their team-leader status against the attentions of a new generation of young and hungry pretenders. Button versus Montoya has all the makings of a titanic and classic duel in the years to come - Button's smooth Euro sophistication against Montoya's Latin flair and flamboyance. Button has already fired the first salvoes in the form of pointed remarks during pre-season testing. Montoya has offered little in return, but that could change in a hurry once the serious racing gets underway. The 2001 season will be far more than just a massed battle for the WDC - it will feature several intriguing one-on-one duels as well. Hakkinen will throw everything into his attempt to regain the title of champion driver while Schumacher will try equally hard to complete a legendary double for Ferrari. Coulthard and Barrichello have talked the talk, it's now time to deliver on those promises. Heinz-Harald Frentzen, Ralf Schumacher and Giancarlo Fisichella must show impressive form against their young teammates, or risk being sidelined in the race to glory. But most of all, 2001 will be about the 'next great rivalry'. Button and Montoya are destined to clash as teammates in 2003; the tone of that rivalry will be set this year. We never did get to see Prost and Senna duking it out in dominant Williams cars. Button versus Montoya could be even more thrilling.